The first point of contact that most customers will have with your business is your website. For this reason it’s important to connect your website to your Booking Page, to give customers a direct path to book an appointment online, rather than having to call you. Setmore gives you numerous tools to link to your website to your Booking Page. Pro Tip: The best place to put the “Book Appointment” button will be the first screen of your home page (also known as “above-the-fold”). Virtually all blog, website, and social media platforms let you create hyperlinks out of a line of text. This is the easiest way to connect a webpage to your Setmore Booking Page. In Setmore, go to Apps & Integrations and retrieve your Booking Page URL. 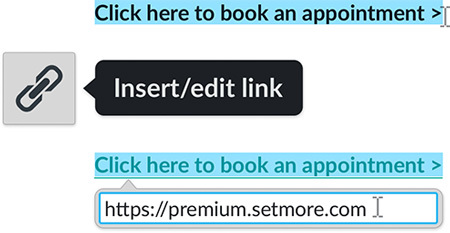 Paste your Booking Page URL here and save your changes. Most website builders will have an HTML/Embed widget that you can drag and drop on your webpage. In Setmore, go to Apps & Integrations > Booking Widget. Fill out the options for 1-3, then select “I’ll embed the code myself” and copy all the code there. 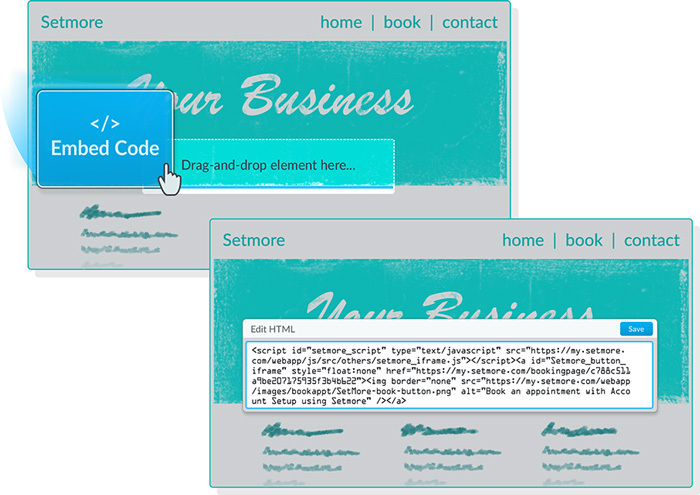 In your website builder, drag and drop the HTML/Embed widget onto your webpage. Open the details menu for the HTML/Embed widget. When prompted to enter the HTML, paste the code that you copied in Step 2 and save your changes. If you have access to your website’s HTML, this is probably the most expedient route. Go to Apps & Integrations > Booking Widget. Open the HTML file of the webpage to which you’d like to add the Book Appointment button. Paste the code where you want the button to appear. Save the file to your server and you’re done! Click the chat bubble in the lower right corner to message our 24/7 team of experts, or email help@setmore.com.